We hear a fascinating and inspirational interview with Diana Beresford-Kroeger, philosopher, naturalist, world-recognized author and scientist whose writings combine western scientific knowledge and the traditional concepts of the ancient world. 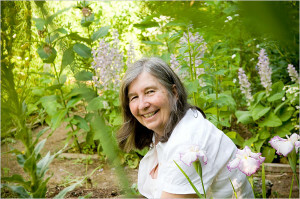 Her books include The Sweetness of a Simple Life, The Global Forest, Arboretum Borealis, Arboretum America, and A Garden for Life. Born in Ireland, Beresford-Kroeger was orphaned in her youth and educated by elders who instructed her in the Brehon (Ireland’s indigenous system of law from Celtic times) knowledge of plants and nature. She tells us about her life and about her Bioplan, which encourages ordinary people to develop a new relationship with nature, and to join together to replant the global forest.